I like to think I'm the kind of person open to the opinions of others, and I certainly don't expect myself to be right all the time. However, it's still rare for me to advertise when I think I am wrong, yet today is one of those days. I just heard about Red Box doing a trial with Libraries across the country. This is a fantastic idea, there currently is no Red Box in Chelmsford Center. Attached is a link for you to look at. In case you've never heard of Red Box, they are dvd vending machines which rent new movies at $1 per night. The machines are located outdoors and are available to the consumer 24/7. Red Box pays the library and also allows the library to free up cash from having to purchase current films. It would be great if Chelmsford could get in on this trial!! businesses a green light to target library patrons. scrambling to fill the holes in our collection. DVDs in our dropbox, those who put ours into the RedBox, patrons demanding refunds and tech support from the circ desk, blah blah blah. I know Conway makes money off our printers and the FaxVend people do too, but RedBox feels way more commercial - like letting a dealership put used cars in our parking lot to make it easier for patrons to shop for cars. Or letting a bookstore set up a table of bestsellers in the lobby and sell books so patrons don't have to wait on a long reserve list. I don't know exactly why I don't like it, but right now I'm leaning against it - but again, it might just my mood. Blah. So my question is this: why I am wrong? I don't feel like I'm right, because I can see positive aspects to a Redbox being in front of the library (especially for libraries that already charge $1/DVD), and it's unusual for me to be this negative. I don't think that every new idea or technology has a place in every library, but still, my answer on this surprised me. So I thought I'd ask the wider library world for your opinions on Redboxes and libraries. Lots of good comments were posted on Tame the Web when Michael talked about this last year, but I'm still not entirely convinced. What do you think? Dead Like Me - I've been watching this series on DVD for the last couple months, and the last movie came in last week. It's about a girl who is a grim reaper, living on earth in secret, helping souls cross over (and it has a frog in it). Meet Joe Black - I'd never seen this movie, so when a patron donated the DVD, I took it home to watch it. It's about a guy who is death who visits earth, in secret, and helps a soul cross over. The Black Book of Secrets - I requested this YA book months ago, and it came in last week. It's not about death, but is about the black and sinister secrets everyone carries with them in their lives (and it has a frog in it). Blank Spots on the Map - This is the book I leave at work to read during lunch. It's about all the secret places in the country the government uses for intelligence work and top secret programs - in other words, Black Ops. I always have a lot of things on request, and I thought it odd that this group would all find their way to me at about the same time. Perhaps, rather than serendipity or coincidence, this concurrent collection is actually revealing my true nature in all its secretive blacky deathness. Or, perhaps I just like spies, YA novels, Mandy Patinkin and Brad Pitt. And frogs. Theaters and video stores usually require an age of 17 or older to see or rent an R-Rated release, unless there is parental permission. But something altogether different is going on in some local libraries. 7News' Jonathan Hall investigates. Read the transcript, or watch the video. This is similar to the situation we had here a little while ago (except without the undercover investigators), which prompted us to put label ratings on VHS and DVDs when possible. And it looks like the Boston Public Library, "in line with American Library Association guidelines," is on the same page as us. Libraries do not raise children, we provide access to information. Parents raise children, and we do what we can to support that need - while at the same time supporting the informational and educational needs of everyone else in the community. I found this news report interesting, but a bit sensationalized. I'm sure as long as there are parents and children (and news outlets in need of ratings), issues like this will never die. What Does “Video” Mean Today? 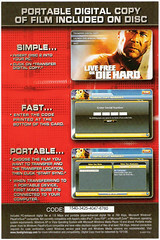 In each of the DVD copies of "Live Free or Die Harder" purchased by my library, we found the little insert shown here. I'd never seen this before, but it is instructions on how to download a digital copy of the movie, from the DVD itself, to your computer (or portable device through your computer). That's novel. It looks like a one-shot deal, as in, you can download it once (using the code on the card, which is internet-verified), and that's it. No downloading to your computer then sync'ing to a device later, or to multiple devices. But still, for those people who purchase the DVD, it's a nice thing to offer an easily-accessible digital format. But bad that it can only be transferred once. And bad that it requires an internet-verified code. And bad that it doesn't work on iPods, PSPs, or Zunes. And bad that it's yet another failed attempt at trying to control how people use the products they purchase.